As of 08.12.2017 the new GeoGR Shop is online, almost exactly 10 years after the first version. A first feedback from a user the day after: " The new GeoGR shop is really great - congratulations! In terms of the availability of geodata, we are already privileged here in the canton of Grisons. But working with the new shop is almost like just having fun ... :-)". We have nothing to add to that ... except: thank you! The GeoGR Shop has been completely redesigned and rewritten. The actual data reference with the corresponding products and the easy to use, customer-friendly processes were only selectively adjusted. The application now complies with the latest security and eCommerce standards. The payment module (still in progress) enables payments via the PostFinance Card and the credit cards VISA or Mastercard. Even before the migration, most data was offered in LV03 and LV95. Now almost all offers are available in both projections. Background: The new national survey, called LV95, replaces the 100-year-old national survey (LV03), based on triangulation. The migration of the data of the digital landuse of the Grisons (NUP) to the new data model version 5 and the frame of reference LV95 is completed. With the new shop, all available NUP municipal data is available in the formats INTERLIS (original), Autocad DXF, ESRI Shape and ESRI Geodatabase gdb. The data transfer to the GeoGR shop is now exclusively in the model version 5 and according to instructions of the directive on digital municipal land use planning. 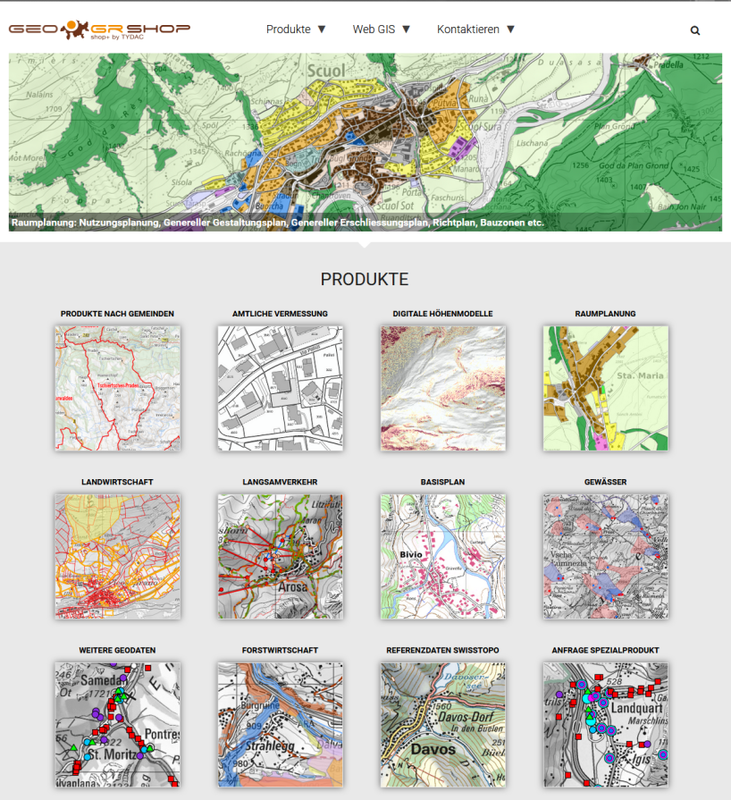 Likewise, the new cantonal Web Services (WMS) have been integrated into the WebGIS. FME Server 2017 on LINUX! Queries on parcels now extended with apartment ownership: Queries on the official survey data allow retrieval of owner information (WebGIS, just click on a parcel). With the new version of the Shop, the request for owners of apartments has also been extended. However, apartment owners can only be queried individually (one by one) due to system restrictions. Please note, that not all communities are available (see SIX Terravis Link, chapter Canton Graubünden) and that the queries are limited to five per day. Slow traffic, query on hiking signs with location sheets:for each sign the location sheets can be displayed as a PDF. DSM 2003 processed: The digital surface model of 2003 (DSM) was (finally) processed in a resolution of 0.5m and integrated into the WebGIS. In total three billion points were processed. Although not really up to date, it is useful to query the altitudes (height of the DSM, DTM and the difference). Fortunately, most of the buildings from 2003 are still standing ... To be found in the second tab under Amtliche Vermessung. Tiling the data of the cadastral survey was reduced to less zoom levels (allows much faster updates). At the same tome, the zoom levels were increased and the maps in large scales are created on-the-fly from WMS (thanks to faster hardware as fast as tiled data).